The second Duke of Westminster, Hugh Grosvenor, met Coco Chanel in Monte Carlo in 1925. 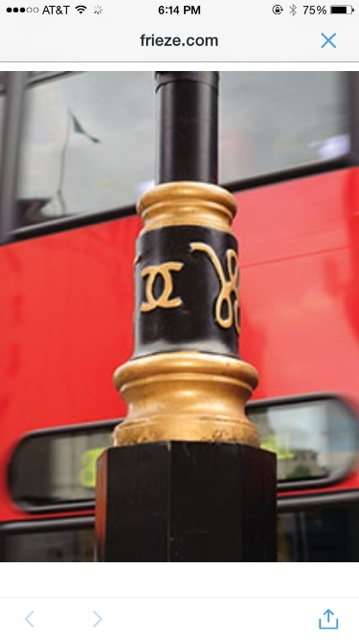 He fell madly in love with her and since he owned all the freehold property in the Westminster area of London, he had all the lamp posts decorated with the W from his cipher and her entwined Cs of her logo. This is an awesome legend and very romantic. They were in a relationship until 1930. The duke was very generous with his lover and one legend says he once sent her an uncut emerald at the bottom of a crate of vegetables delivered to her kitchen. The modern day city council of Westminster says it’s all untrue and that the entwined Cs are for City Counsel. They admit the W stands for Westminster. Look at the entwined Cs and tell me that it’s not Coco’s logo. It sure looks like it is. The city council is taking some of them down and replacing them with plain ones. I wonder why. They are actually very lovely. How romantic I love todays FACT. Thanks Lavada. Me, too. Itâs awesome! Let’s face it, the English aren’t known for obvious displays of romance. Had this happened in Paris, things would be different, right? I am sorry that they are going down.